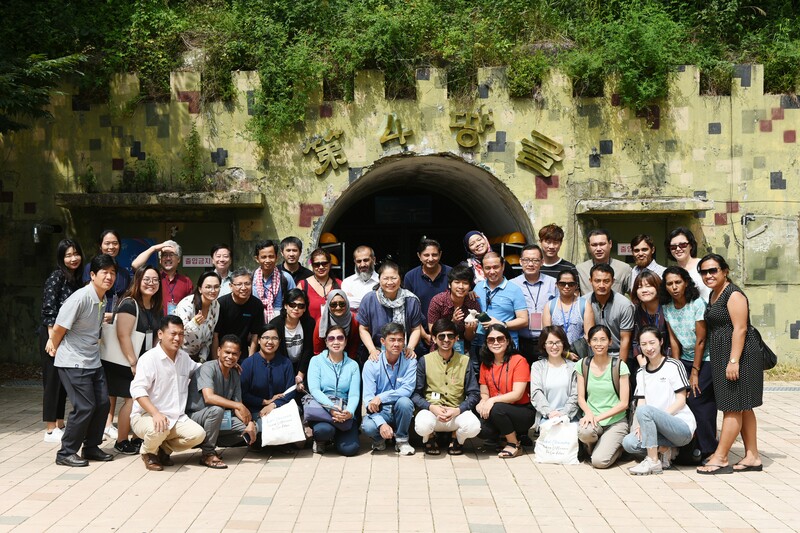 The 18th Asia-Pacific Training Workshop (APTW) of the Asia-Pacific Centre of Education for International Understanding (APCEIU) was held right after South and North Korea took a step toward formally ending the war at the Korean peninsula. The summit meetings at Panmunjon between the President of South Korea (Jae-in Moon) and the Supreme Leader of North Korea (Jong Un Kim) held on 27 April 2018 and 26 May 2018 and the visit to Pyongyang on 18 September 2018 by President Moon for his third summit meeting with Supreme Leader Kim raised the hope that lasting peace might be realized in this generation. There is much at stake for both North and South Korea in obtaining lasting peace that cannot be disregarded. The humanitarian consideration in the form of permanent family reunion and economic consideration in terms of business opportunities for both countries are too important to be ignored. And peace in the Korean peninsula would have significant impact on the political dynamics of Northeast Asia. People in South Korea are likely hopeful yet still gripped with a sense of realism that lasting peace might remain a dream. The summit meetings of the South and North Korean leaders set an important context in the holding of the 18th APTW. The peace issue, one of the key issues covered by the training workshop, assumed a positive notion with the possibility of formally ending the state of war in the Korean peninsula. The visit to the demilitarized zone or DMZ (Eul-ji Observatory and the 4th tunnel) in northeast South Korea, a component of the training workshop program, seemed to have a new meaning due to the hope that the DMZ would no longer be the most militarized border in the whole world in the near future. An equally important context is the call for global citizenship by the United Nations that represents the other side of the coin. People’s action on global issues is not new. The environmental movement has long preached on acting local while thinking global. Many other movements have arisen including those on the rights of women, children, and minorities that have impact at both global and national levels. The backlash against certain rights (especially those of women) in some local communities ironically proves the impact of global ideas. The United Nations sees Global Citizenship Education (GCED) as the main vehicle in promoting people’s participation in resolving global issues. The national educational context is important in integrating GCED into the educational systems of any country (be it the school curriculum, training curriculum of teachers and school administrators and in the non-formal training programs of both governmental and non-governmental organizations). Finally, in contrast to the still growing movement on human rights and continuing discussions on human rights issues at the regional level, resistance to the idea of human rights among people in government and society remains. Continuing violation of human rights in various forms by government authorities and abuse of such rights by the corporate sector are major concerns. The APTW in general has to deal with the realities at different levels – from global to local – in promoting GCED as a transformative educational intervention. The 18th APTW had participants from twenty-two countries in Asia and the Pacific. They included school teachers, university lecturers, teacher trainers, heads of college departments, officers (heads) of education offices, and non-governmental organization (NGO) workers. Training sessions were held in Seoul (APCEIU building) and in the DMZ area (Korea DMZ Peace-Life Valley Training Center) in Inje province. Being anchored on GCED, the APTW program generally covers peace education, human rights education, and other educations. The 18th APTW program included a session on human rights (“Understanding Human Rights in the context of GCED”) and also on gender equality (“Gender Equality as a Shared Vision of Social Justice“). Other sessions had human rights content as well (“Cultural Diversity & Intercultural Understanding,” “Glocal Justice & Peacebuilding & Education for Local/Global Justice,” and “Democratic Dialogism and Communication”). As training workshop output, many follow-up action plans of the participants mention human rights. Several participants cite human rights either as single topic of the action plan or coupled with other topics such as mathematics and human rights (understanding human rights through the mathematics lense), cultural diversity and human rights, and human rights and national constitution). A couple more of the follow-up action plans cite gender equality as topic of training. d. The context of a training program on GCED has a more expanded character considering the SDGs. Many issues such as poverty, hunger, health problems, lack of access to education, gender inequality, lack of water supply and sanitation, unemployment, unsustainable cities, bad consumption patterns, destruction of natural resources have to be seen from a human rights perspective. Thus current issues at both national and subregional levels are important contexts in making any training program on GCED relevant. Making people act on local, national and global issues is laudable yet it is fraught with challenges. People’s participation under the GCED framework appears as essential element in resolving issues and has less politicized character (not espoused by political groups), and therefore has less possibility of encountering rejection among educators in the formal education sector. Jefferson R. Plantilla is the Chief Researcher of HURIGHTS OSAKA. For further information, please contact HURIGHTS OSAKA.